On December 1st, the Duquesne University pharmacy residents held an event at the Spartan Community Center of Hazelwood, PA. This community has limited access to food, health services, and many basic needs. With gracious support from Father Dan Walsh, former pastor of St. Stephen Catholic Church, the residents were able to coordinate with the church to provide care and services. The church provided a food bank for the community members while the residents offered health services, including free flu vaccines and naloxone counseling. 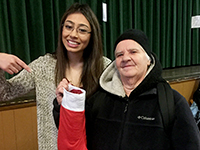 The residents also filled 120 stockings with gloves, socks, hats, and scarves.